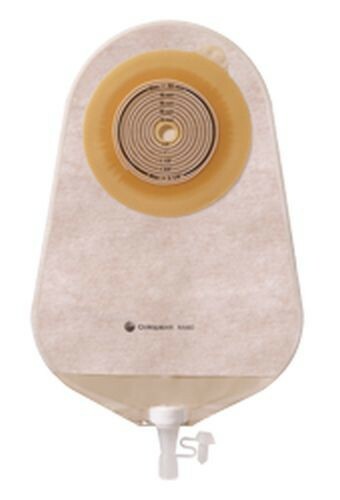 The Assura Original 1-piece Urostomy Pouch, by Coloplast, offers a secure adhesive barrier attached to a pouch. A 1-piece solution is best for individuals who have a sensitive stoma and therefore need to reduce the number of pouch changes that can further irritate the stoma. Coloplast uses a specially designed spiral shaped barrier that also minimizes skin irritation. It has skin-friendly material that absorbs moisture from the skin. The Assura Original 1-piece pouch comes in flat or convex barriers with pre-cut or cut-to-fit opening types when you want to create your own custom fit. Convex is especially helpful because it applies moderate to high pressure around the stoma to reduce urine leakage when stoma shapes are difficult to manage when located near a scar or skin fold or when the stoma is retracted. The pouches come in transparent or opaque color in either maxi or midi size. 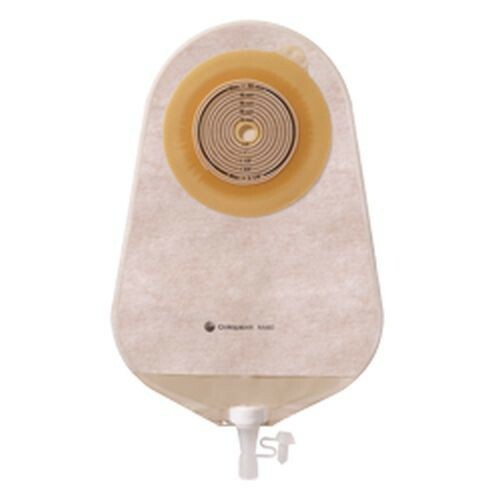 It comes with a soft plastic outlet that's easy to empty and its anti-reflux valve ensure the stoma is protected from the urine to reduce irritation and infection. Some options have built-in belt tabs if you are interested in using an ostomy belt. You may also want to purchase Brava Adhesive Remover in spray or individual wipes to gently lift the appliance without causing further irritation to the skin.